The walnut finish is a really nice touch. A high build quality throughout the device. Listening experience ticks all the boxes. Auto-off feature is a little lacking. Fluance is most well known for their all in one speaker systems, but has recently begun exploring the increasingly popular (for the second time) world of turntables with a couple of models of their own. Let’s take a look. When first unboxing the Fluance RT81, the immediate impression one gets is that this is a high quality, premium product. From the elegant sheen of the dials in their gunmetal finish to the walnut of the turntable itself, the RT81 punches far above its weight in the looks department relative to competition at this price range. In fact, we’d go so far as to say that it is amongst the best looking entry level turntables we’ve come across in any of our reviews. As well as looking the part, this device feels it too. It is sturdy, weight, and robust. Not in an impractical way, just heavy in a way that implies quality rather than the flimsy, plastic, could fall apart at any moment sense you get from several turntables at around the same price. The S shaped tonearm comes with a detachable headshell that is pre-mounted with an Audio Technica phono cartridge. The RT81 features a phono preamp built into the device, and this means that you will be able to play records via any wireless speakers that come with an analog audio input jack, or to a computer or receiver. If you like, you can use an external preamp which will allow you to customize the experience more to your personal preference. The tonearm has a counterweight system which is precisely calibrated to set the required force, and its base is set into an anti-skate dial which means you don’t have to approach the set up with a ‘take your best guess and hope for the best’ attitude. It should, in theory, all just work. And it did for us. Set up was extremely easy, and the included manual even goes so far as to talk you through the basics of how turntables function as you go through the process to make sure that even a novice gains some level of understanding about what they’re doing and why they’re having to do it. The sound signature of the RT81 is best described as rich, warm, and weighty. The overall effect is very solid, and is, of course, only improved by hooking up extra equipment. This, too, is an easy process and well worth it for the benefit that it affords to the experience. The auto off feature is a little lacking in utility, and didn’t quite live up to our expectations. Instead of the whole system turning off, or the tonearm rotating itself back to its stand once the record has finished playing, you actually have to lift the arm off the record in order to get it to stop. If you don’t enable this feature, all that happens is that the record carries on turning until you turn off the power. A little odd. 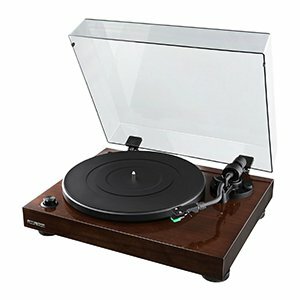 Though light on additional features, the RT81 is a fantastic turntable for both the novice and the enthusiast alike. A fantastic aesthetic which feels robust and well-made is married with an audio performance that manages to deliver on all fronts.